A few days before the glider invasion, our squadron, "B" Squadron, moved about 100 miles to Tamu. The theory was we could fly round trip to pick up injured and wounded from Broadway because we were now 100 miles closer to Broadway. One day we had an elephant visit us for breakfast. He came right through our eating area pulling a chain and we scattered like flies. An exciting breakfast to say the least. We watched gliders fly above us the next night of the operation and we flew into Broadway the next morning. Capt. Edwards was our C.O. but Rebori led us into Broadway. We flew single file, two minutes apart on a zig-zag route. The clearing had been bulldozed by dozers brought by glider but it was rough and dusty. It was decided that C-47s would fly into Broadway at night and fly out the injured because the Japs had no night fighters. The L-5s would supply the columns of Chindits and fly the wounded back to Broadway. These were the injuries suffered by the Chindit columns and the forces at the rail block at White City. 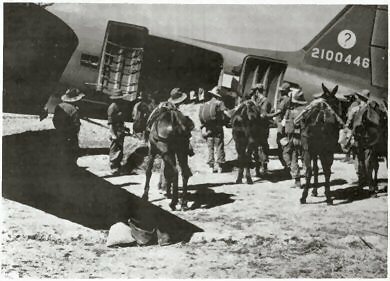 The first night at Broadway, the C-47s unloaded gasoline, food, and hand grenades among other things. The grenades were stacked in boxes near a fox hole. A box fell into the fox hole and four or five grenades popped loose. None of the Chindits or pilots were willing to jump into the hole. After five minutes of all of us standing around, a civilian, a London reporter, jumped into the hole and put the grenades into the box. I heard several weeks later that the reporter was killed. He may have been on board the B-25 that crashed near Imphal with General Wingate aboard. The first night at Broadway, we learned that Charles Fisher, L-pilot and a Chindit passenger had not returned from a spotting mission that day. It was a time of sorrow for Fisher and a blow to our morale. It took the Japs eight days to find us and bomb us. The first day of bombing and strafing left my hammock full of holes. That night it rained heavily and within minutes the water was up to my chin. I slept in a plane that night and most nights thereafter. One night after supper, we sat around a fire sipping some combat whiskey when I heard a pilot named Wm. Barber talking seriously to his friend on my right. Barber gave the friend his watch and wallet with a letter to give to Barber's wife. Barber had just been assigned his first mission at Broadway and had a premonition he wasn't going to survive. I couldn't believe it. I had already flown three or four missions with no problems. Barber was right! The next morning, his plane was strafed on the ground while taxiing Frank Cowan to his plane. The planes were parked and camouflaged over a wide area in the woods surrounding the air strip. After the strafing we ran to the plane and found Barber dead but Cowan was still alive. We carried both bodies to Major Tullock, our Doc. A bullet had pierced Cowan's body completely and Tullock plucked it out with a forceps. The good news is that Frank Cowan lived. I saw him 18 months later chasing a 19-year-old red head. One morning Capt. Edwards said to me, "Ruksas, you can push your plane three feet farther into the woods if you chop down the tree behind it." The tree was probably teak and about 12 inches in diameter. I said, "All I have is a machete." Edwards said, "YouVe got all morning to do it, you don't have a mission this morning." So, I chopped for about four hours which created spasms of laughter from the other pilots, and succeeded in pushing my plane back three more feet. I then went to chow and the Japs bombed and strafed us as usual at chow time. We dived into fox holes and after it was over I resumed eating. A few minutes later, a pilot told me the bombs had burned two planes down where the woods curved. Sure enough, my plane and Howard Smith's plane across from mine burned to the ground. Only my tail wheel could be considered usable. It was bad enough to lose my plane but after four hours of hard work, it seemed like double tragedy! About three days after arriving at Broadway, two Chindit columns that had marched out, asked for food drops. We had bomb racks on each wing that could hold 100 pounds of food. All four flight leaders went out with about five planes during the next two days and came back with the food. The Chindits were to signal when they spotted the planes with a verry pistol flare. On the third day, Capt. Edwards came up to me and said sarcastically, "I hear you're a hot navigator. Do you think you can find the troops?" I said I would try. So, Edwards gave me the map coordinates for column 1, then column 2, then for a code book drop about 80 miles south. I said, "So far no one has found one of the columns and youVe asked me to find both of them, plus a column who wants a code book?" He said. Try." So, I took six planes, flew over the 1st column and a flare came up. We dropped six bundles to very happy troops. I sent three planes home, then flew about 40 miles to the next set of coordinates, another flare and another drop to happy troops. I sent everyone home and flew to the code book drop -no flare - no drop. From then on, I fed the Chindit columns from Broadway. One of the unluckiest pilots on Broadway was Tom Purcell. He had dysentery most of the time and a badly sprained ankle. The good fox holes were dug by the Churkas, deep in the woods. The holes were big and covered with logs and dirt. Our radar would pick up the Jap planes about 30 miles out. A 105 howitzer fired would be the signal and we ran deep into the woods to those good fox holes. But Purcell limped and filled his pants. We would run together and if the planes were only strafing, we would hide behind trees. Once, when we were both behind the same tree, I jokingly told Tom to find another tree. He was hurt so I quickly told him it was only a joke. We left Broadway the day after several thousand Jap ground troops were discovered six miles away. Since my plane had been blown up, I left with Lemuel Davis. Davis was in no mood to leave early. We were supposed to have fighter cover which did not arrive and the CO Edwards panicked when the Japs bombed us instead. He said, "Leave everything and go." Many thought that meant weapons and they left them. Davis and I picked up about 20 carbines and 45s and were the last to leave. When we arrived at Dixie about 50 miles away, we gave them back. At this point, I wish to pay tribute to the six Spitfire pilots who gave up their lives for us at Broadway. Each day they went up to do battle, and the last one to take off was strafed on the ground, because of the dust created. The Spits had to wait for the dust to clear and the last plane in line was caught every time. Five days - five killed! Thirty-two Jap planes came over on the last day and the Flight Leader went up alone after them. He did not come back. General Wingate spoke to us L-pilots the day he died. He praised our work and told us he would try to get us commissions. We appreciated his words but did not think a British officer could get Field Commissions in the U.S. Army - or could he? He died that night so there was no chance to find out. NO. 1 AIR COMMANDO loads for trip to Broadway. Photo by 1st Signal.